Location Wensleydale. West Burton CP. Pasture below Ashby Gill. 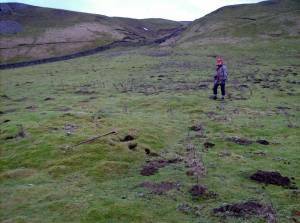 Record Name Burnt Mound below Ashby Gill. Site 2. Record Description This medium size burnt mound is located on the bank of the same diverted watercourse (sike) in pasture immediately below Ashby Gill as Ashby Gill Sites 1 and 3. A coaxial field system (unsurveyed) which extends from Stoneywood Plain to Hudson's Quarry aligned at right angles to the slope across these pastures. Small stone banked curvilinear enclosures denote the existence of settlements nearby. Additional Notes This burnt mound is the central of three burnt mounds on this small stream line. Only the uppermost part of the mound is visible above the present ground surface. Consequently, the overall size of this site may be much larger than the above dimensions indicate. A linear group of no less than eleven burnt mounds have been recognised on the line of the intermittent watercourse which rises at an elevation of 500m AOD some 300m NE of the large settlement on Burton Moor and the springs which rise below Mortham Scar Wood,at 220m AOD. Image 1 Description West Burton CP. Ashby Gill Pasture. 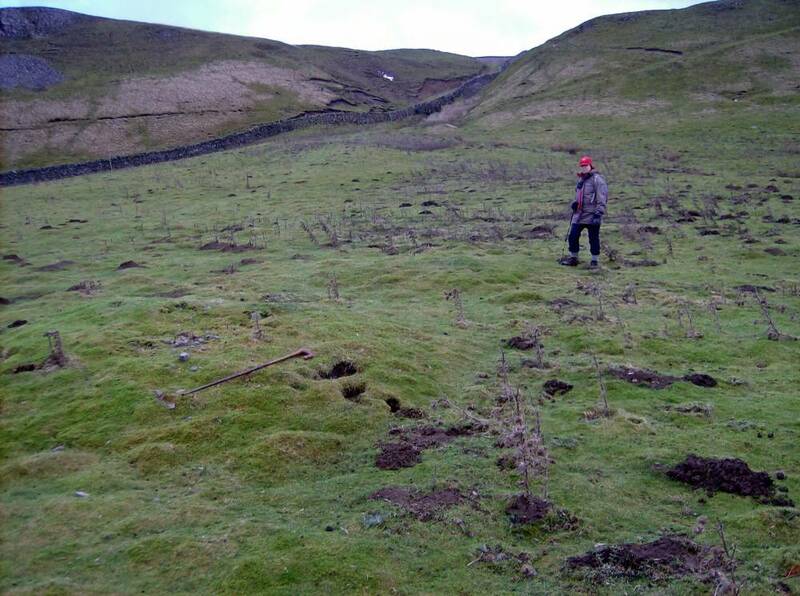 Burnt Mound Site 2, view towards Ashby Gill and Site 1, Site 3 is 200m further down the same diverted stream.